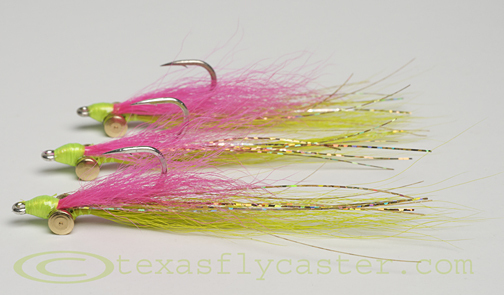 Clouser flounder fly in very effective colors, and available in the Fly Shop. Wondering what flies to throw at your favorite funky fish – the sometimes finicky flounder? Wonder no more. If you want a guaranteed proven fly that will entice even the most hesitant bottom hugger, have a look at a simple design of the Clouser Minnow, a mid to deep runner made for the salt in the colors flounder like most. If you want more details regarding leaders, retrieve methods for this strange fish, or even where to fish for flounder – hit reply, and ask away. Order your Clouser Flies in quantities of 3 in the Fly Shop now!